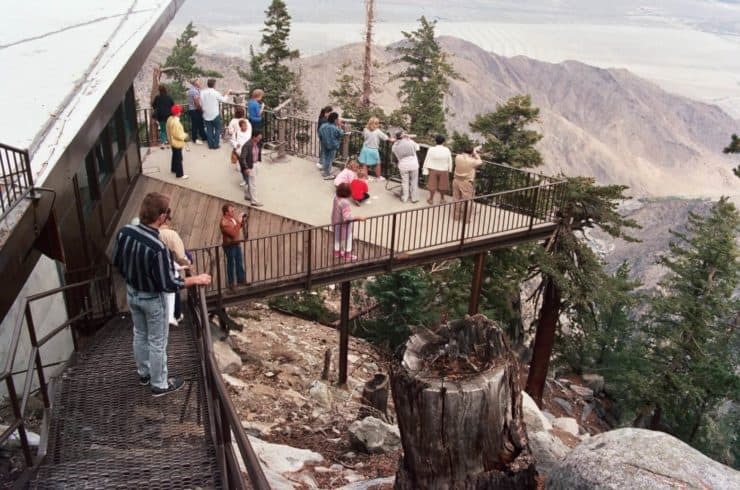 The journey actually starts at the Palm Springs Aerial Tramway base station, which is where you take the tram 5873ft up to Mountain Station, which is still 5.5 miles away from the summit. There is a fee to park your car at the tram station. The tram station is about 15 minutes west of downtown Palm Springs off the main road. 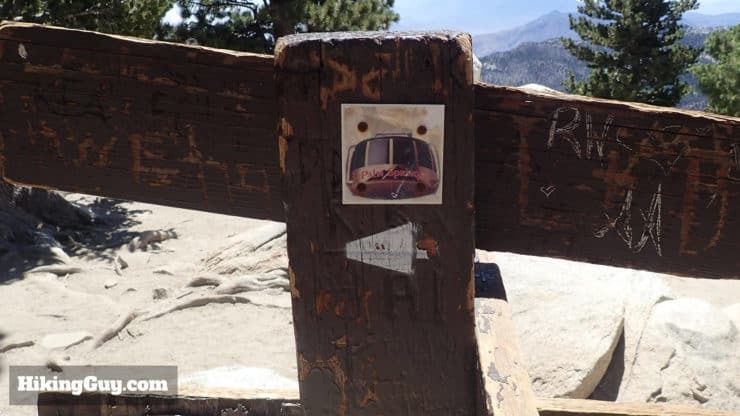 The address for the tram is: 1 Tram Way, Palm Springs, CA 92262. The tram ride to Mountain Station is a unique experience. 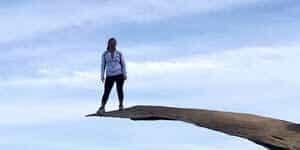 If you’re scared of heights, you’ll probably want to keep your eyes closed. Photo by Don Graham. Half of the fun is taking the tram to Mountain Station. 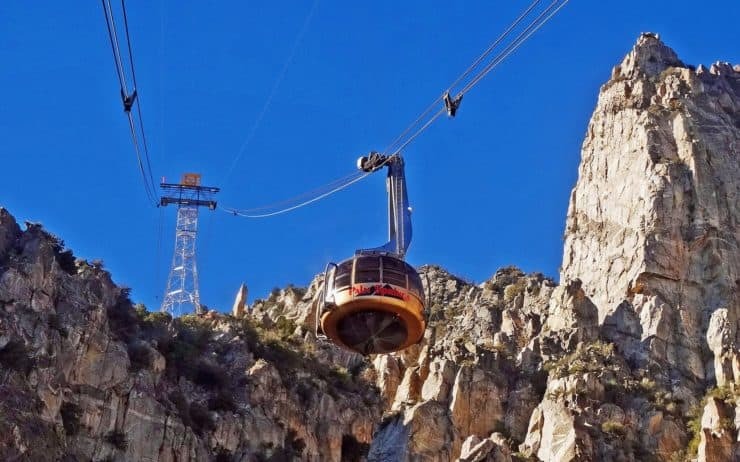 The tram is the world’s largest rotating ariels tramway, starting in the Sonoran desert and ending in an alpine zone. And yes, the floor rotates as you go up and down, giving everyone a view at some point. Some people freak out on the tram ride, just a heads up. If it’s windy out, the tram will sway and move with the gusts. It’s designed to do this, but can still be a little scary. I’ve been on the tram with a woman screaming at full volume for the 10 minute ride. Luckily, there’s alcohol at the top. 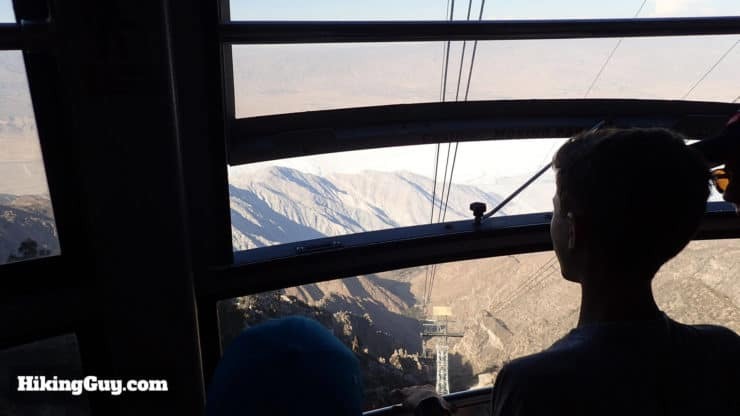 The tram schedule, parking fees, and ticket costs change, so I recommend going right to the Palm Springs Aerial Tramway website to get all the details. 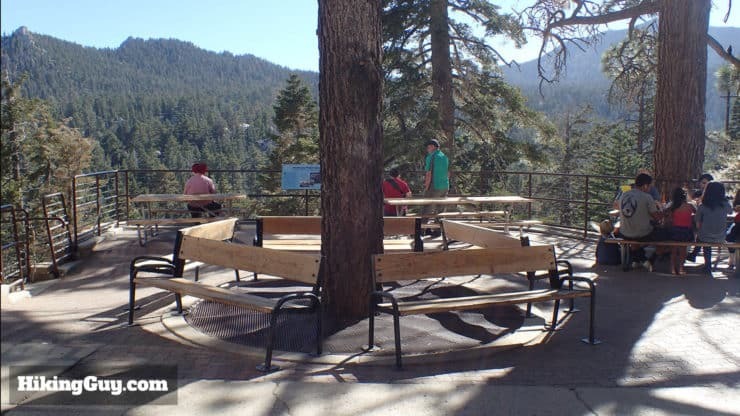 There are lots of observation points around Mountain Station to check out. Photo by Alan Light. The Valley Station at the tram has limited facilities, just bathrooms and a gift shop. 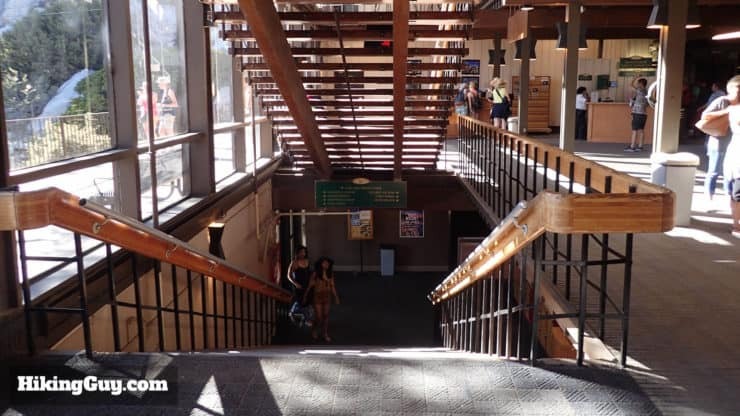 At the top, Mountain Station offers bathrooms, and interpretive center, gift shops, a bar, a food court, and a sit down restaurant. You could just make a trip out of a visit there, and plenty of people do. 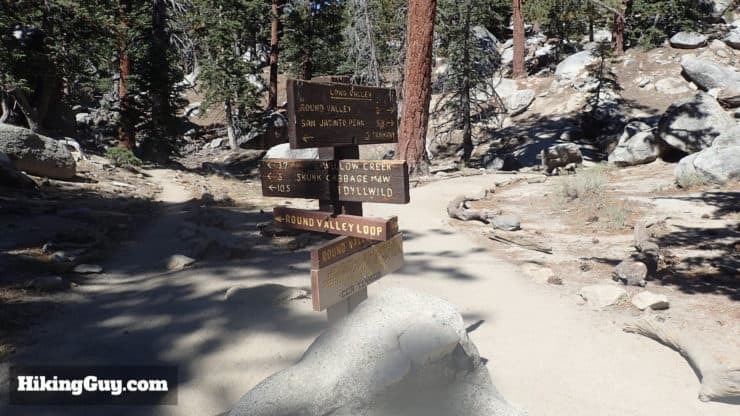 There are a few nice short hikes and walks from the tram station that you can do if the hike to San Jacinto summit is too much for you. When you plan your visit, try to take the first tram up in the morning to avoid the crowds. The tram and the hike can get really busy. Also, look at the schedule and see when the last tram down leaves. If you miss this, you’ll be sleeping on the floor at Mountain Station. Budget in time after your hike to grab a bite and a beer at the tram station. There are also interpretive exhibits that are worth a look. 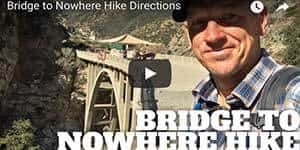 Don’t let the fact that you take a tram for a few thousand feet fool you, this is a “hike” hike and you should be prepared. 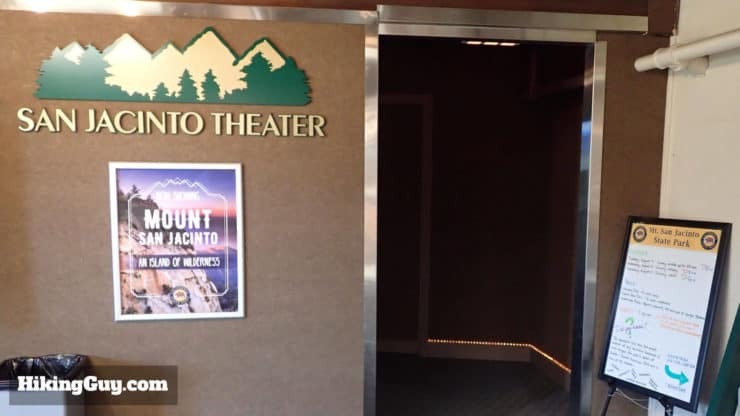 The first thing to note is that the weather will be different at Mountain Station than it will be in Palm Springs. 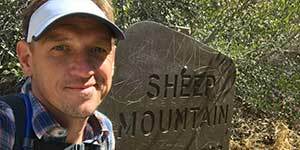 Sounds like common sense but you’d be surprised at how many people are not ready for the hike. 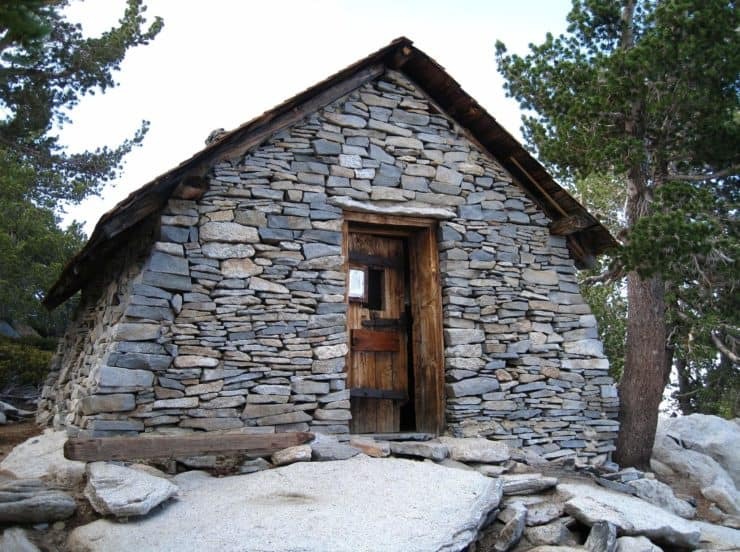 This is the emergency hut just short of the San Jacinto summit. They don’t put these in places where the weather is benign. You need the right gear for the weather on this hike. Photo by Will Beback (if that is your real name..). 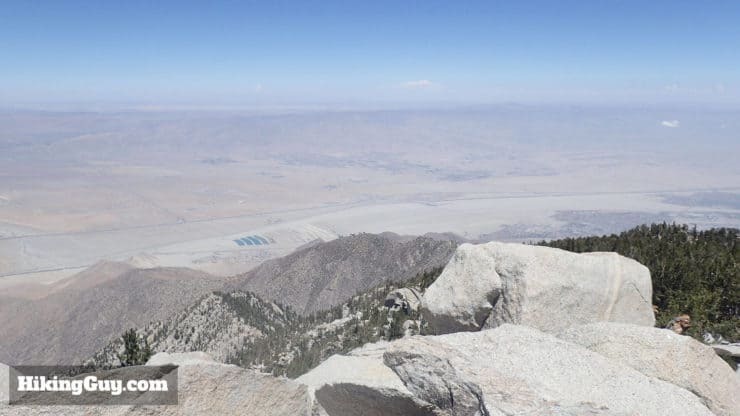 In the summer, the summit will be about 30 degrees F cooler than Palm Springs, making for a nice temperate hike. In the winter, the summit can be covered in snow and ice. And for just about every season it will be windy at the summit. 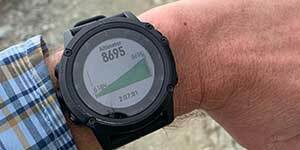 Before you do the hike, check the weather at the summit and prepare for those conditions. If it is wintery conditions, check the tram, they sometimes close. And if you don’t have winter hiking experience, be ready to turn around if the conditions are bad. Usually the hike gets a lot of traffic, and even in the snow it can be doable, but if there’s fresh snow and you don’t have established tracks to follow, you should probably give it a skip. 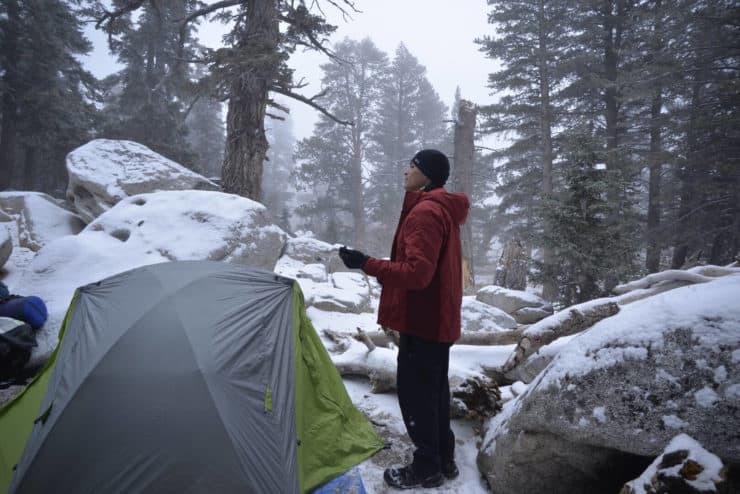 If you camp on San Jacinto, be ready for the weather to change. It usually gets pretty cold up there too, which is nice in the summer. 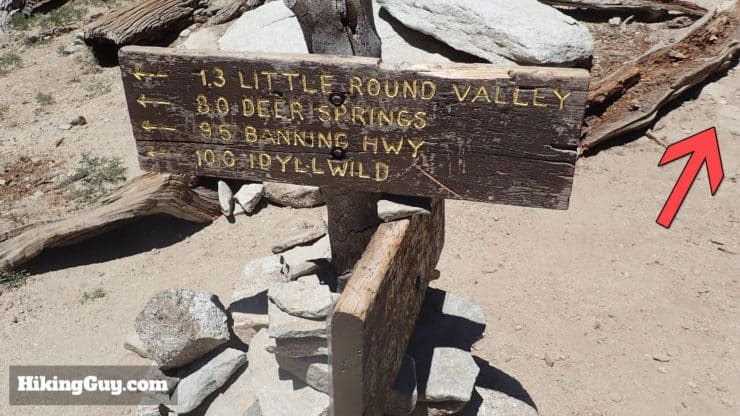 You can also camp close to the summit at Round Valley (read below in directions). 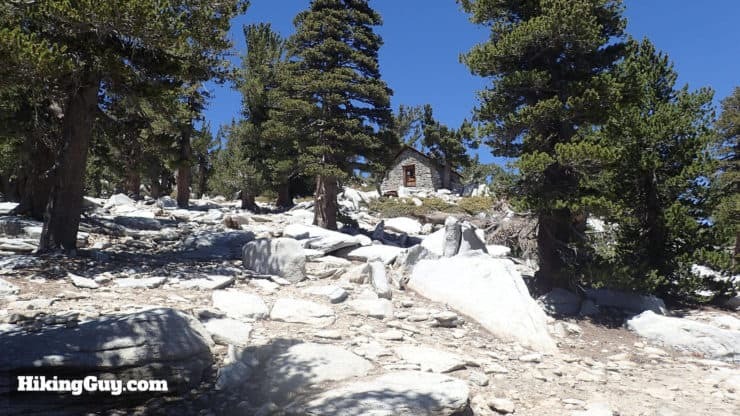 It’s a fun little campsite and a good place if you want to spend some time at altitude or split the hike into two segments. 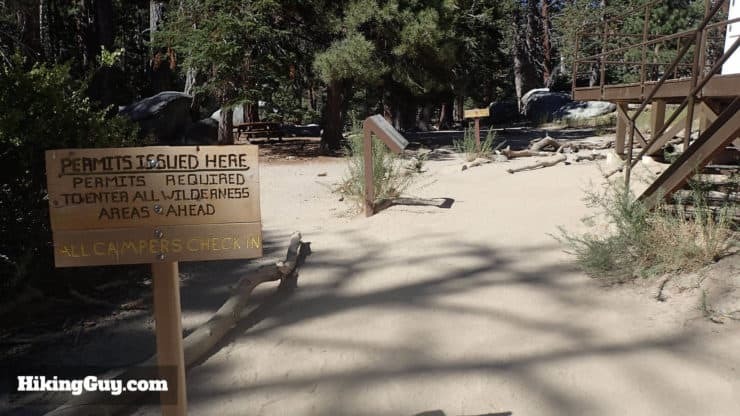 If you camp at Round Valley, you can leave for the summit early and have it to yourself. 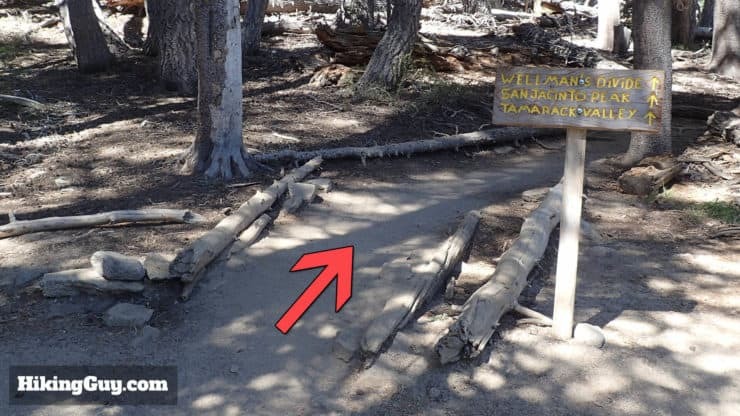 You can also leave your gear at the campground and just summit with a smaller pack, but make sure your food is protected from mice and rodents. You don’t have to worry about bears here. 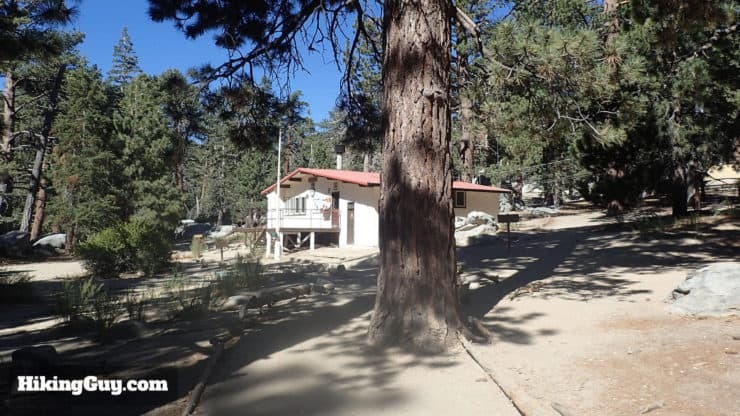 To camp at San Jacinto, get a permit here and send it in. You can book it 56 days out and can also ask for no-shows on the day of. 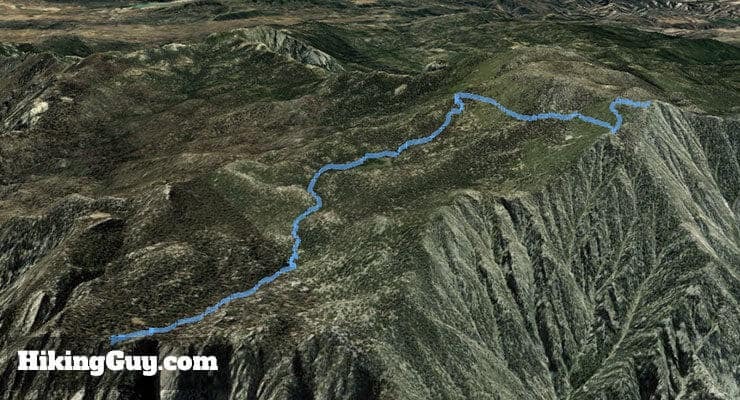 What I find interesting about this 3d map is the drop off around the hike. Look how steep it is before the start at the tram, and off the face of the summit. You get to skip all that on this hike, but as you can see, there’s still a fair amount of (gradual) climbing. There’s no getting around it, you have to climb on this one. 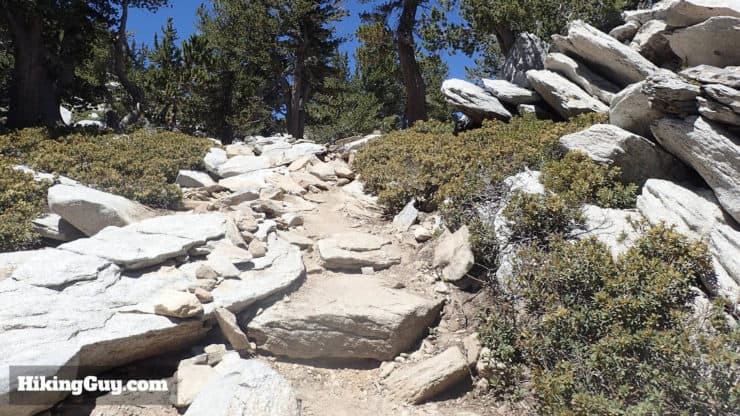 The good news is that the trail isn’t very steep, the bad news is that there are not many flat sections to catch your breath. The steepest section is the very end to the summit, but at the point you are so close you just grit your teeth and do it. Have fun on the tram ride to Mountain Station, soaking in all the climbing that you get to skip. 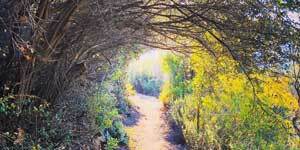 If you want to do the hike from the desert floor, there’s the epic Cactus to Clouds hike for experienced hikers. When you get off the tram, go to the back of the station and find these stairs down. There’s a nice little interpretive film if you have the time. It’s right by the exit to go outside (down the stairs in the last shot). 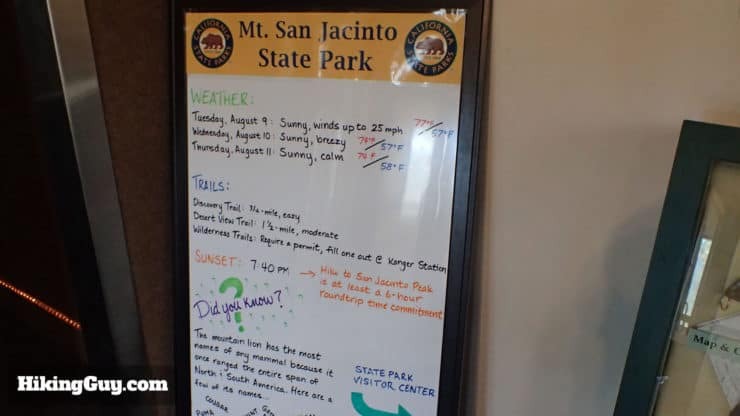 Make sure you check the board for any trail alerts or weather updates. Head outside to the picnic benches on the station deck. 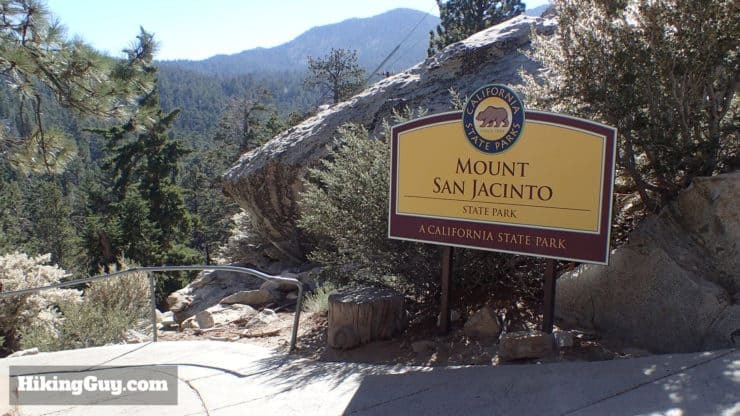 You’ll see a sign for Mount San Jacinto State Park. Head down the concrete path to start the hike. The path down is steep and you will hate this at the end of the hike, so enjoy it now. 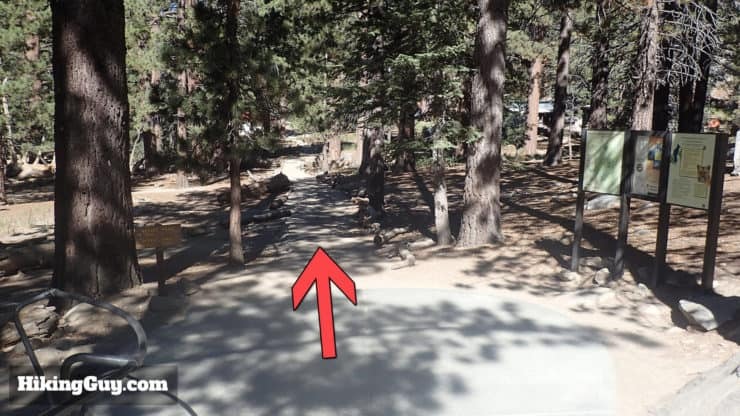 When you get to the bottom of paved path, go straight through the trail junction. 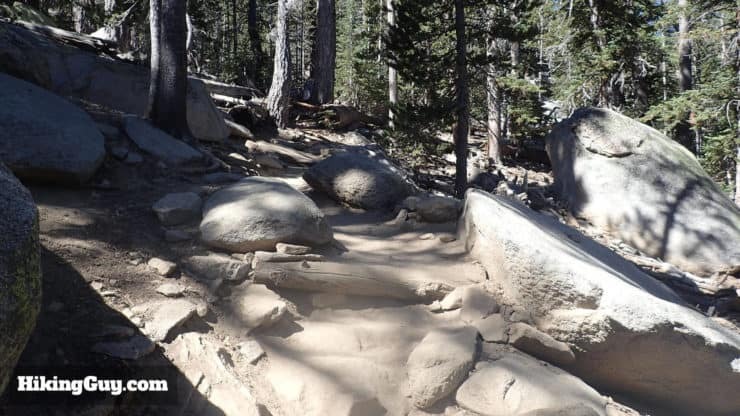 It’s worth checking out the hiking board for any trail updates. A nice trick is to take a picture of the trail map with your phone in case you need it later. And if you don’t have a signal up here (you might not), put your phone in flight mode to save the battery. When your phone is constantly looking for a signal, it will run the battery down quickly. 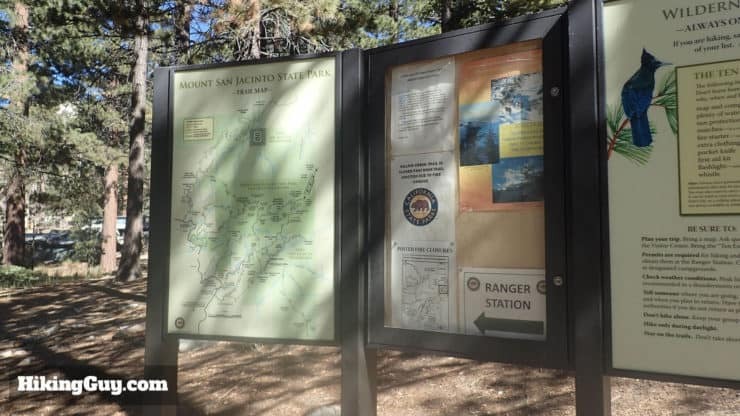 The next stop is the ranger station where you need to fill out a free self-serve permit. 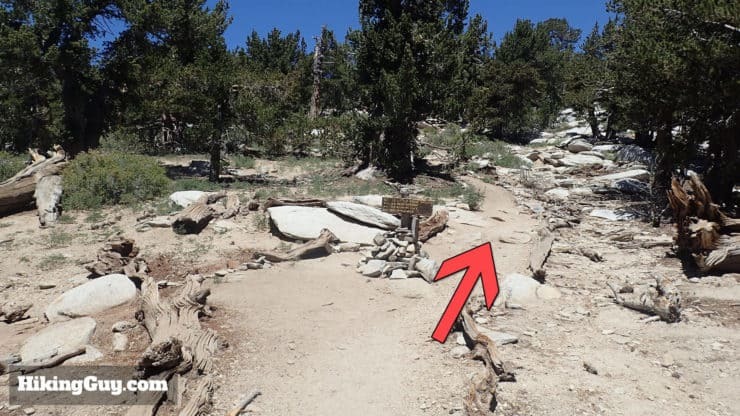 This helps the rangers know if anyone is lost on the mountain after it all closes. 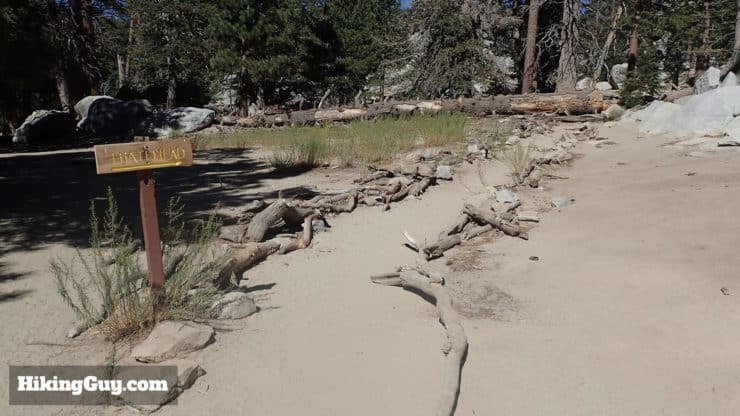 The ranger station is just past that last sign. 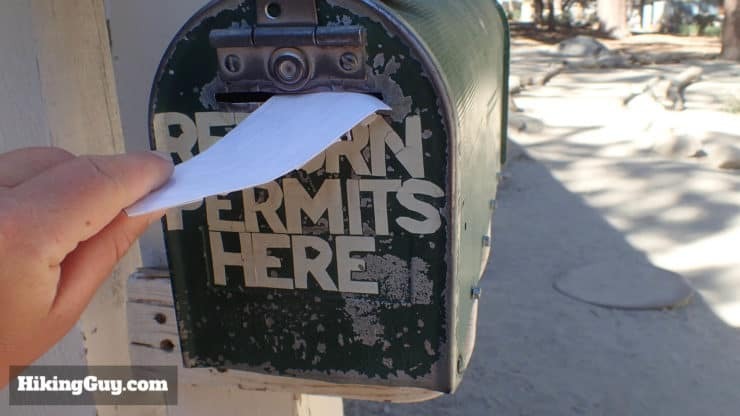 You’ll see signs letting you know about the permits as well. 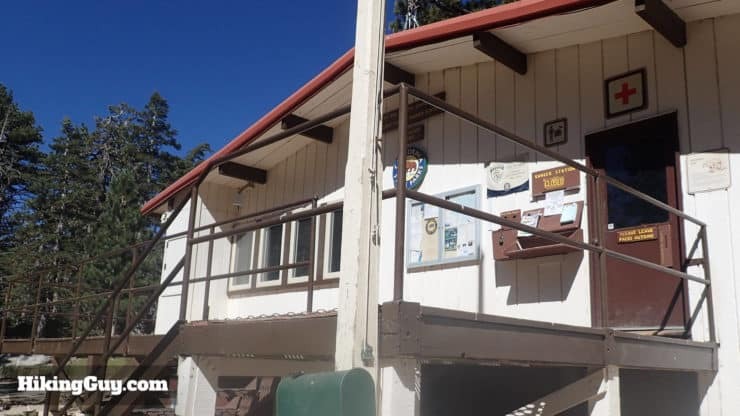 If you’re going past this ranger station, you need a permit. It’s not just for campers. 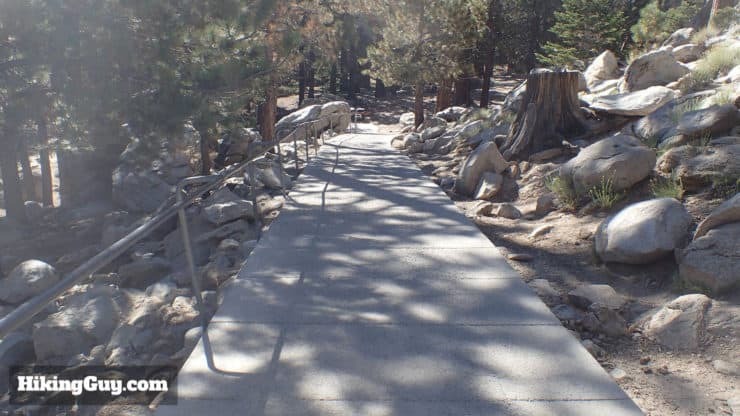 Head up onto the front deck of the ranger station. There are primitive bathrooms here and sometimes there is water from a spigot in the back of the station. 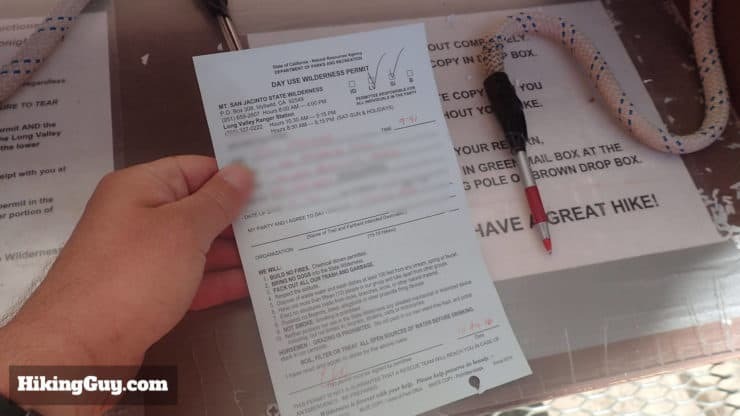 The self-serve permit station is pretty straightforward. Fill out the form and drop one copy in the box, taking the top copy with you. 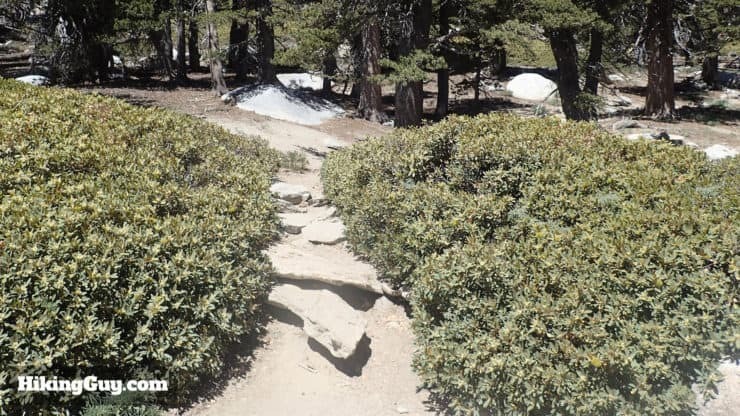 From there, keep hiking on the trail that passes the ranger station. Soon after the station, there’s a big trail junction sign. 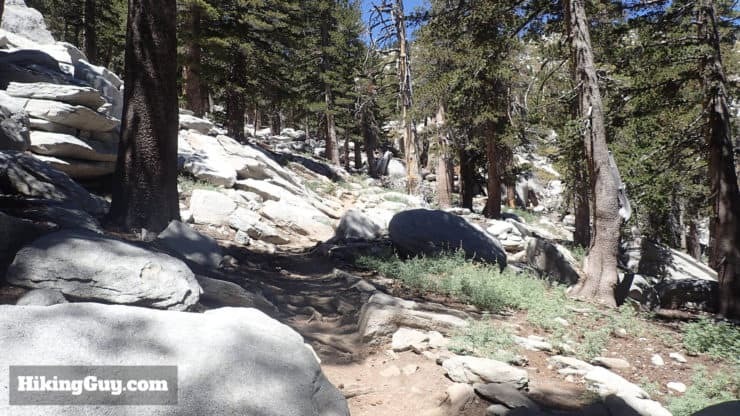 Keep heading straight toward Round Valley and San Jacinto Peak. The trail starts heading uphill. There are some up and down sections on the beginning of the hike where you can catch your breath. The trail makes a sharp left at the boulder. 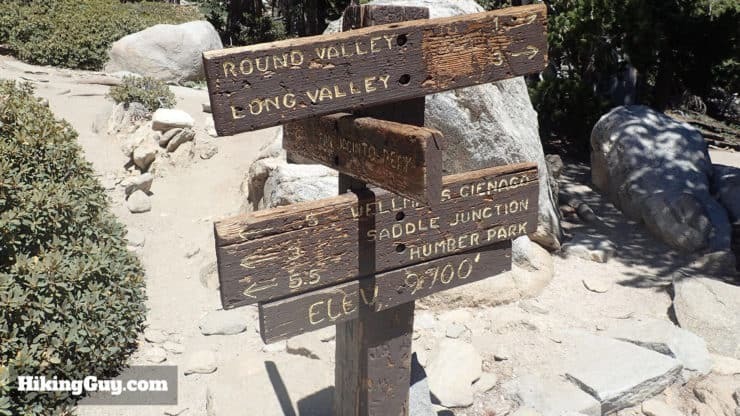 Head towards Round Valley, which is your first major landmark on the hike. Follow the trail as it goes more consistently uphill. 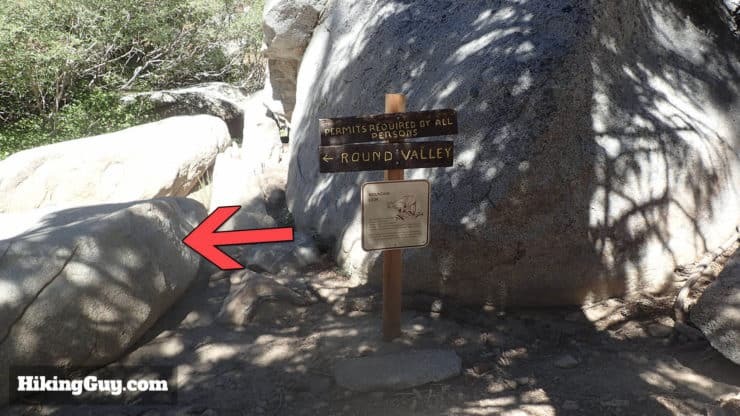 Avoid the Round Valley Loop to the left and continue on the right toward Round Valley proper. Just past that last junction there are some primitive toilets for the Round Valley campground. This is your last chance to go before the summit. 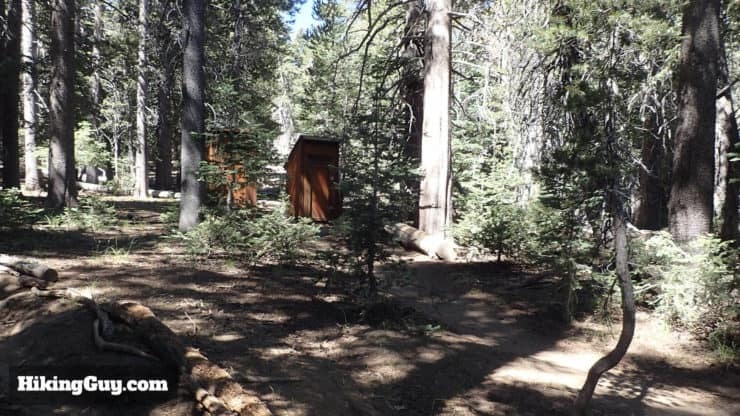 The bathrooms are about 50 feet off the trail to the left. 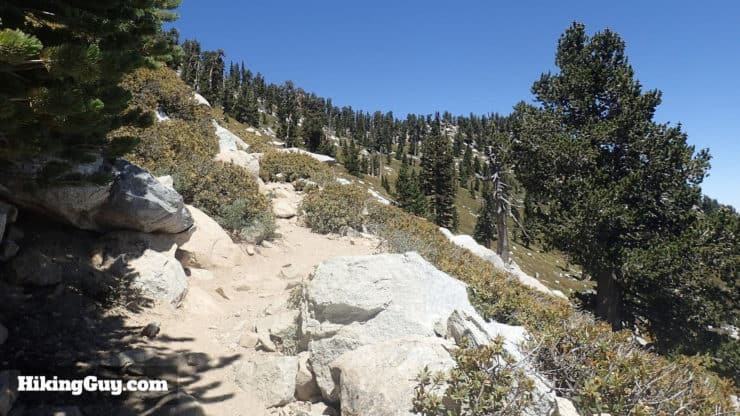 Keep heading straight toward San Jacinto Peak. 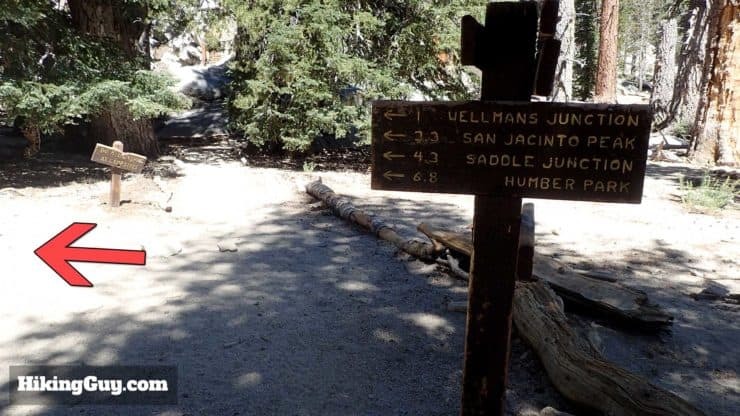 When you get to the Round Valley campground, follow the signs and hike to the left toward Wellmans Junction, your next stop. There might be water at the intersection, but it’s not reliable. 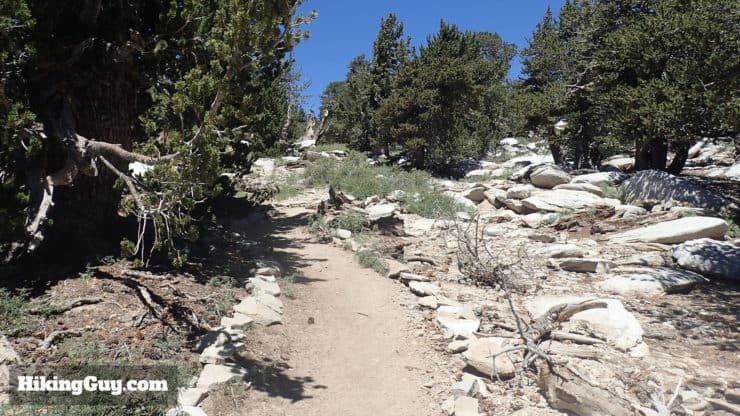 The trail gets a bit steep as it goes up toward Wellmans Divide. 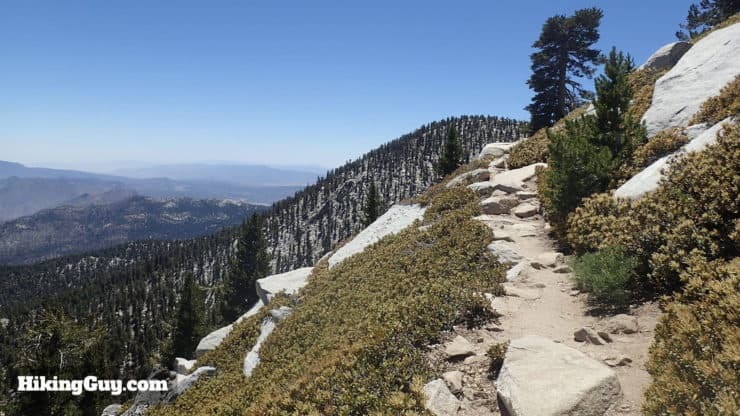 After climbing for about a mile, you’ll start to see the sky and ridge at Wellmans Divide. 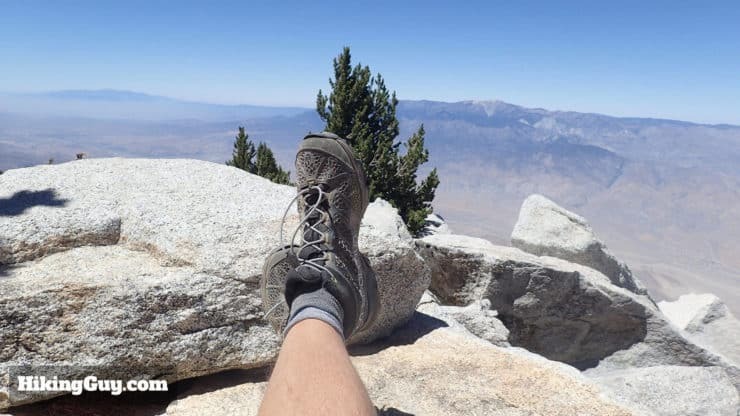 Enjoy the views from Wellmans Divide, then hike right. At Wellmans Junction, you’re going to head through to the right. Here are the details on the sign at Wellmans Junction. 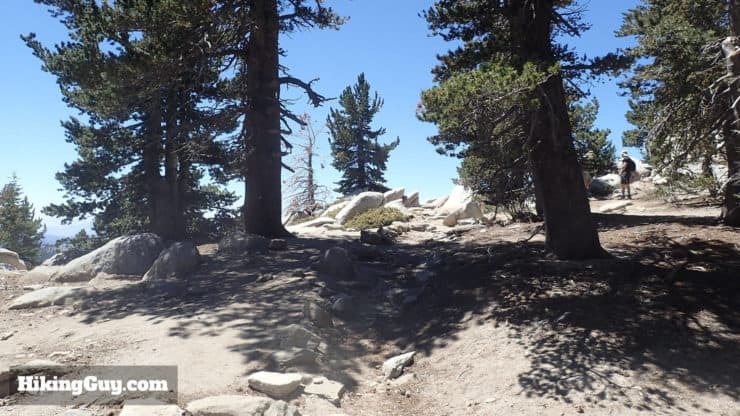 You’re at 9700 feet, congrats! 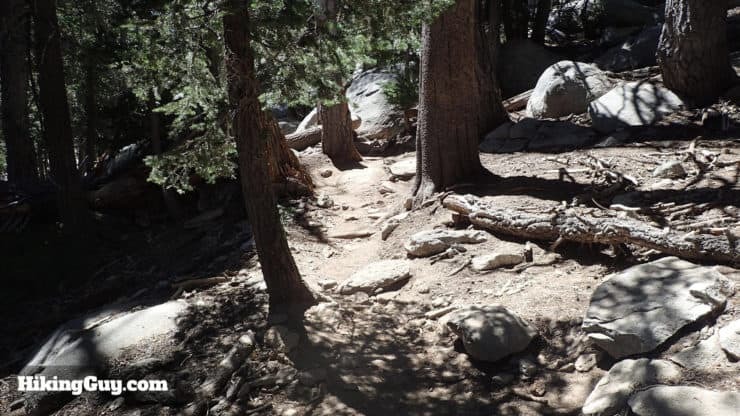 You’re following the trail toward San Jacinto Peak. 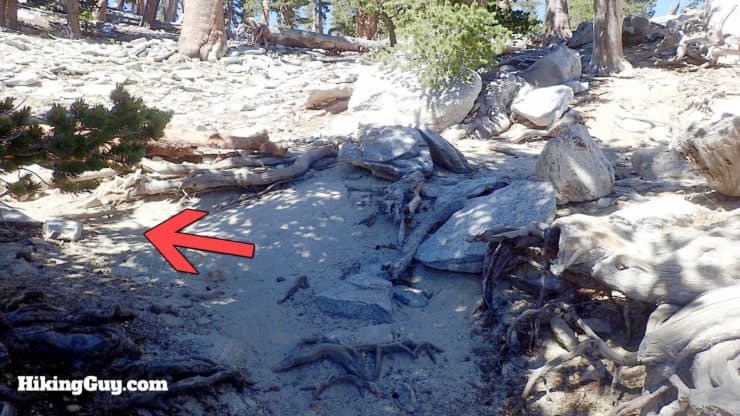 Here’s what the trail looks like right after that last junction. From here on out, you’re hiking uphill. Take your time, especially if you’re not used to the altitude. You’re getting less oxygen up here, and need to adjust your effort accordingly. 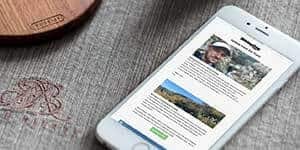 If you have a headache or nausea, you might have altitude sickness, and need to stop or turn around. 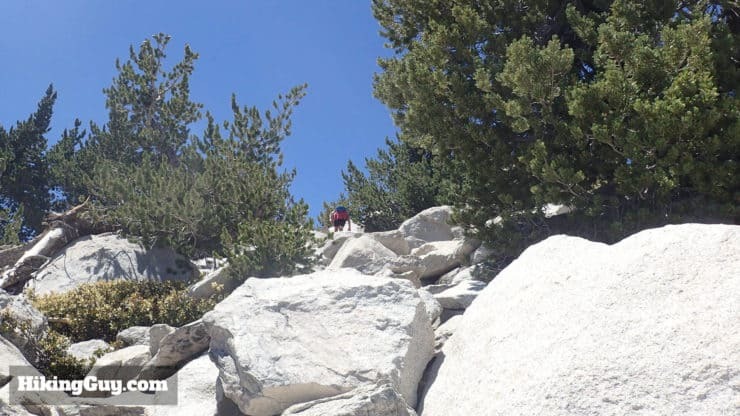 Read my rundown of altitude sickness signs and symptoms on my Mt Whitney hike page. It’s serious enough to kill people, and you need to treat it seriously if you have the symptoms. After a while the trees end and you’ll have incredible views to the east. 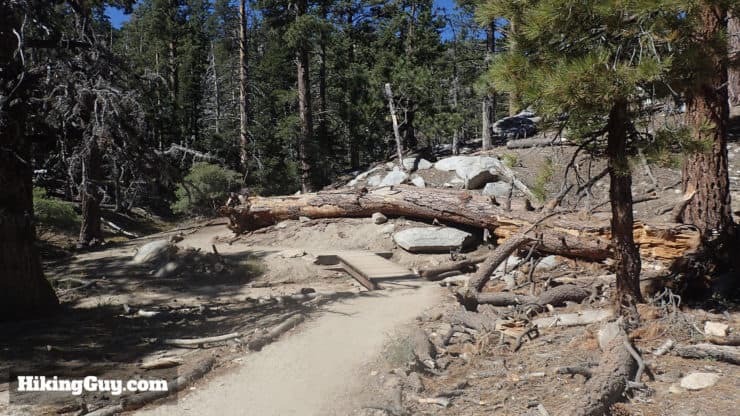 After a long stretch on that last exposed section, the trail doubles back. 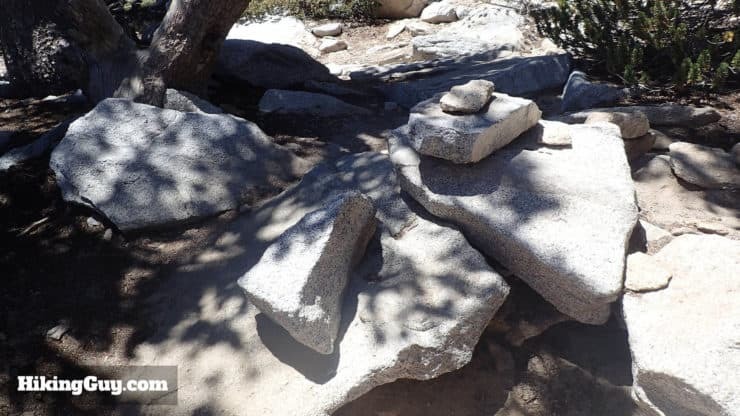 Keep your eyes open for large rocks blocking the (straight) path. After the last turn, the views are incredible again. 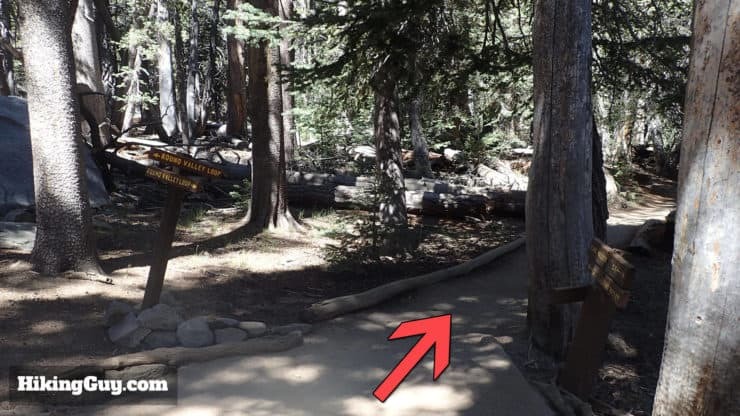 The trail winds to the right and into an area with trees. You’re almost there. At the trail junction, go straight. Here’s the detail of that trail sign. Don’t mistake Little Round Valley for Round Valley on the way back. Two different places. The trail is well marked and keeps going up. Soon you’ll see the refuge hut. This is the last little stretch. 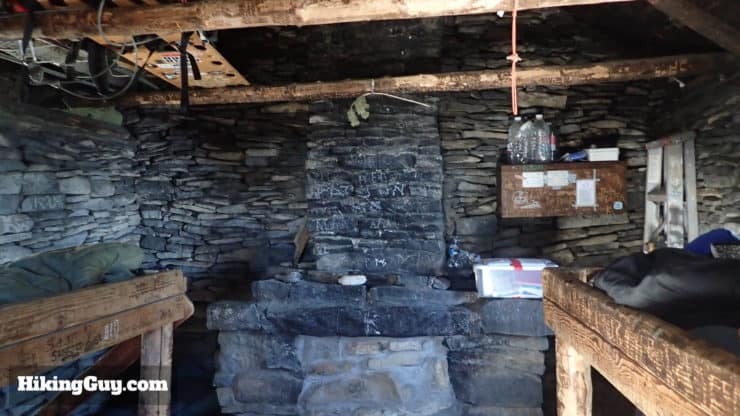 Feel free to checkout the hut and leave any extra supplies you might have for hikers in danger. If the conditions are bad, you are free to take refuge in here. 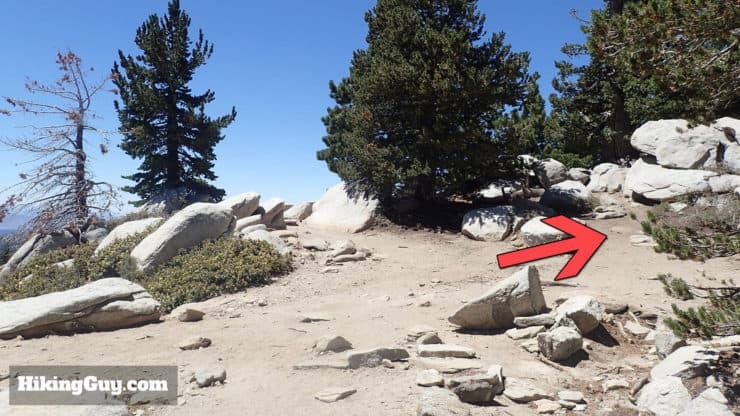 Also, some people leave their heavier packs outside of the hut and do the final stretch to the summit with lighter gear. It’s generally safe to leave a pack outside here. Continue past the hut and head towards the summit. The trail turns into more of a scramble on this last stretch, splitting and coming back together a few times. Look for rock piles (cairns) to confirm your path. Some sections are marked with stones on the side. 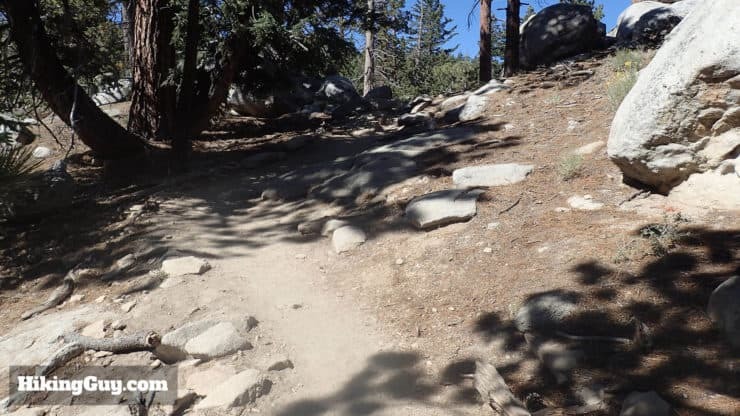 As the trail gets steeper, it gets less defined. 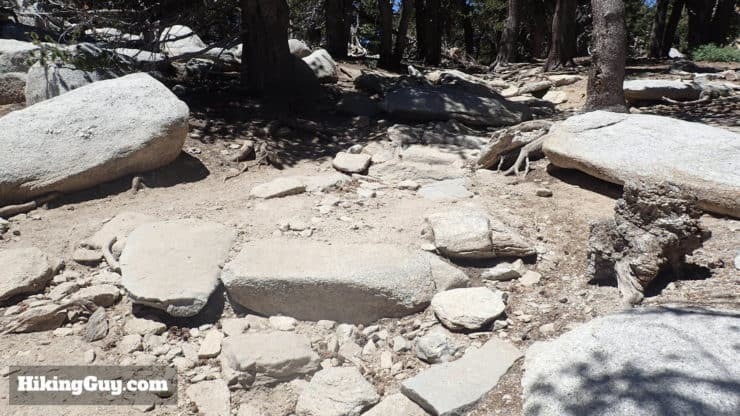 Look for stone piles and footprints to show you the right way. If you come to a dead end, just backtrack until you see the right way. OUCH! The last hundred feet are straight up. At last, the summit sign will come into view. YOU DID IT! Get your shots with the summit sign and pat yourself on the back. To the west you should see Orange, Riverside, and LA counties, and their (greener) fauna. To the east, you’ll see the Sonoran and Mojave (north) deserts, and their barren landscape. 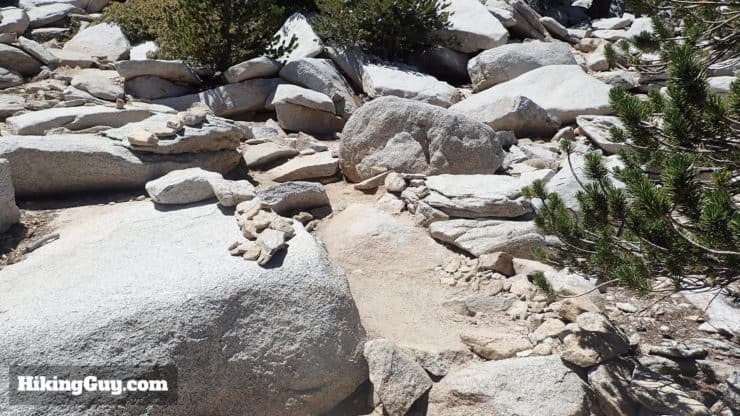 Take your time to relax on the comfy rocks at the summit. 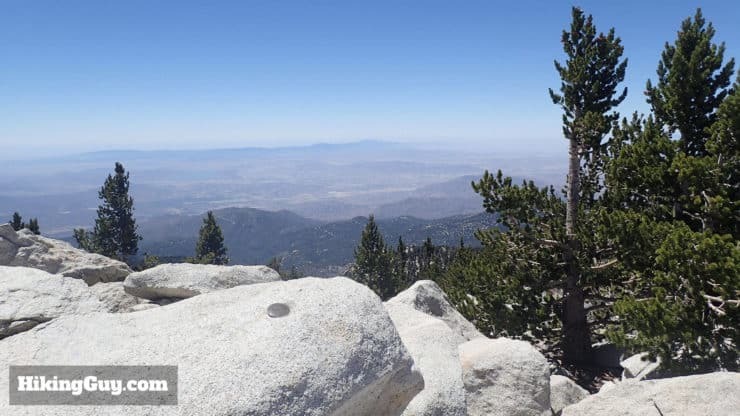 Across the valley is southern California’s highest peak, San Gorgonio, which you can also hike to. After the summit, head back the way you came. 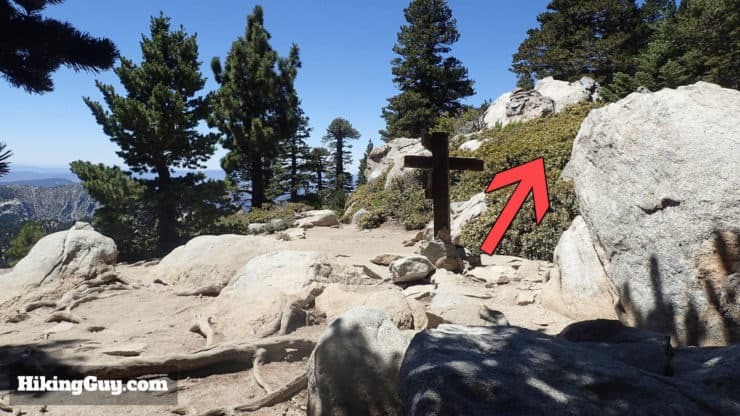 Some of the trail signs have this handy tram marker if you don’t remember which way to turn as you descend. 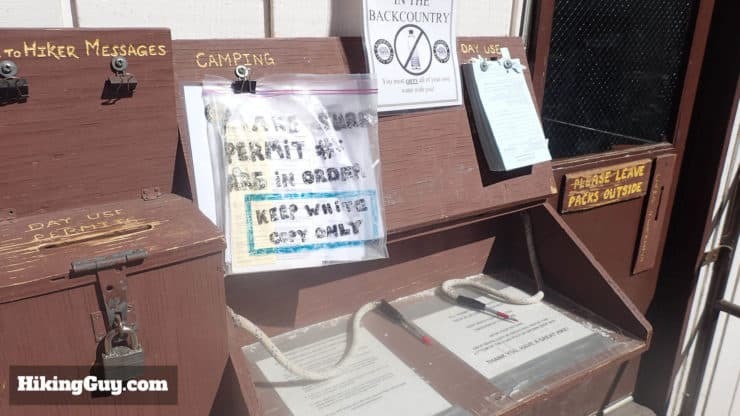 When you get back to the ranger station, drop your copy of the permit into the box to let the rangers know that you’ve safely completed the hike. That’s it, you did it. 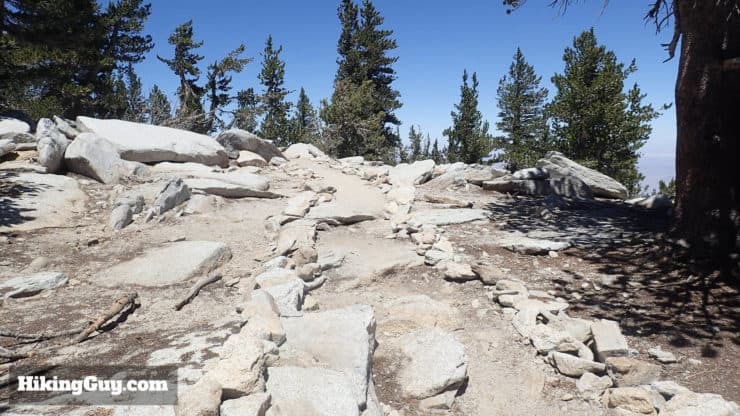 Even though you had the tram, it’s still a very tough hike. Enjoy a bite or drink at the tram station and head back down the mountain. 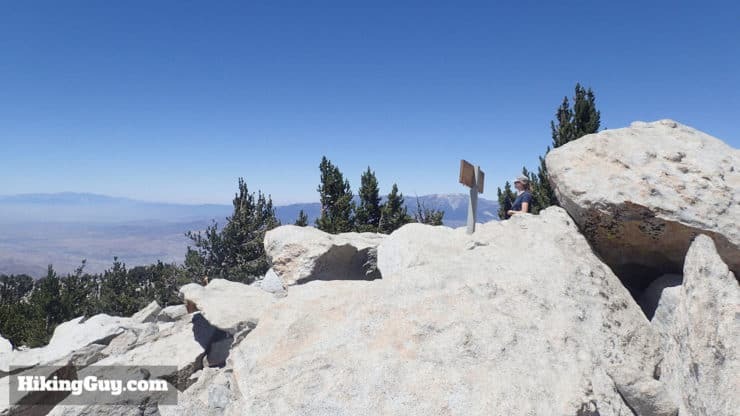 If you’re fit and experienced, there are a few other ways to do the Mt San Jacinto summit. 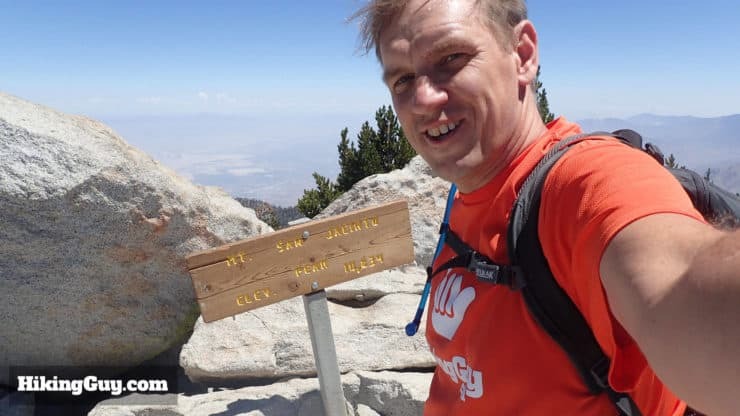 My favorite is a 19.5 mile hike from Idyllwild (which you can do as an overnight backpacking trip), and you also can do the epic Cactus to Clouds hike, which is one of the hardest hikes in the USA, starting at the Palm Springs Art Museum and ending at the summit. Please, please, please, please do not do Cactus to Clouds unless you are very experienced and know what you are doing. 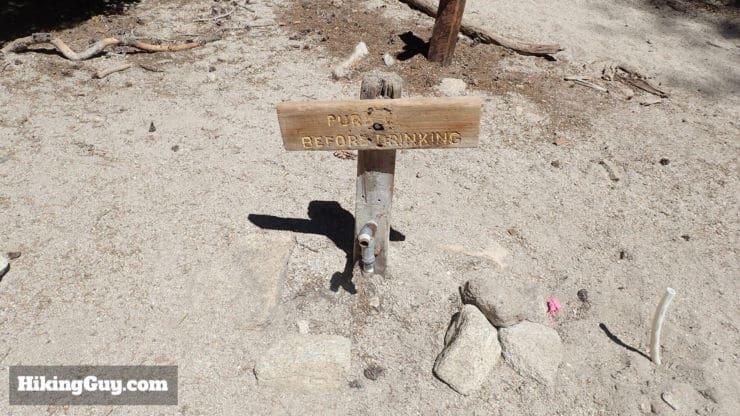 People die on that hike.